Here at Messiah College, the first day of finals starts on May 9th. That leaves our class with only about 2 weeks to finish our City Beautiful project. Although the depletion of time has caught us all a little off guard, we certainly are proud of what we’ve done. Besides the City Social project, which we have reported on throughout the semester, we have studied a movement that most of us had no previous knowledge of before this class. The City Beautiful movement in Harrisburg, or even just Harrisburg in the 20th century, were not subjects any of the students in our class were very familiar with. However, we learned of many key players and actions of this movement, which reflected a national sense of improvement and possibility that was prevalent at that time. Now that we have a general sense of the movement, we have been squeezing in time during our busy schedules to visit archives to find further information and documents on the subject. We have been digitizing these artifacts so that we can display them on our Omeka site as digital history exhibits on the movement. Although there is not much time left to work on the project, there is still much to be done. Many of us are still running to the archives in order to reach a 12-hour minimum to be there that we felt was necessary in order to give the project the substantial amount of time and effort it deserves. Recently, several of us paid a visit to the Pennsylvania State Archives to do some more research. Here is where I came across a couple of problems I had not experienced before in my short time in the archives. 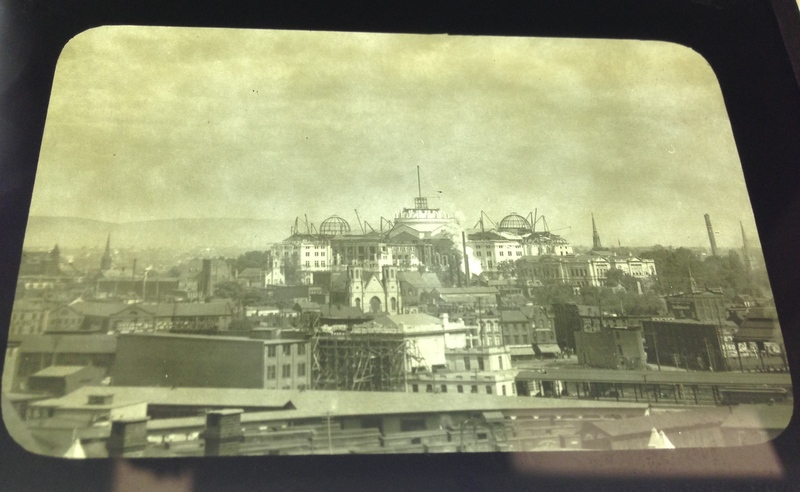 A negative of the construction of the capitol building. As you can see, the glare of the lighting above was certainly a challenge. In my search for documents, I came across a list of negatives that J. Horace McFarland had taken during his time working in Harrisburg’s City Beautiful movement. 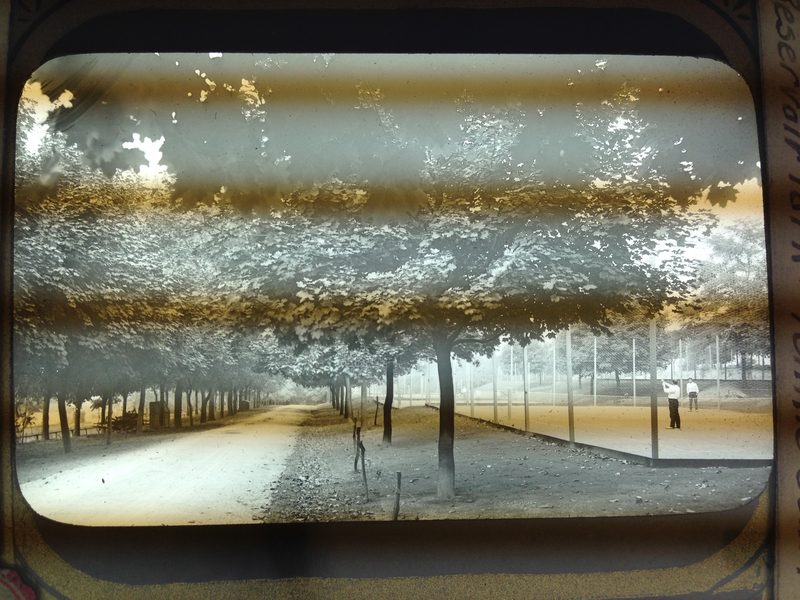 These negatives are pictures of various parks, streets, and buildings throughout the city. Many of these images were of the various improvements he worked to implement, like the construction of the capitol building and the new hospital the movement had worked to implement. However, in the State Archives, these negatives were located in a group of files that a specialist in the time period had been reorganizing. When I requested the negatives and the archivists went to retrieve the files, they found that they were gone from the original spot and could not ask the specialist who was out of state for a conference. This was an issue that was uncommon for the archivists and certainly was a setback that I did not foresee. Luckily, by fate or luck, one of the archivists happened to find the files in a random compartment. This is an example of the negatives that displayed light waves through the camera lens. I was excited to work through these negatives. However, then I discovered another setback. The way to look at negatives is to have a light shine through the image by placing the negative on top of a light fixture. Unfortunately, when taking a picture of the negatives on top of a light box, the lens of the camera would pick up light waves that would run through the negative in the image captured by the camera. This substantially decreased the quality of the image. Luckily, some of the negatives did not suffer the same problem with quality. By having this selection of negatives and finding better angles for camera work, I was able to take decent quality photos of the negatives to use for the Omeka exhibit. Although we’re coming to a close of the scholastic year and the City Beautiful project, many of us are still running into setbacks and problems with archival work that we need to work through. With these experiences, however, we continue to learn how to get past the difficulties that come up in the real world of historical work outside of the lecture hall. This work gives us experience that will help us to grow as professionals in the long run, something that is incredibly valuable as a college student.